When Libyan rebels marched on Tripoli in 2011, a Canadian drone led the way. The unmanned aircraft, a product of a company called Aeryon Labs based in Waterloo, Ont., sliced slowly over the landscape, mapping the terrain and sending valuable tactical information to the soldiers. Six months later, a similar scene played out in perhaps the polar opposite setting, as an Aeryon craft hummed across the Bering Sea, relaying ice conditions ahead of a Russian tanker dispatched to deliver vital fuel to the town of Nome, Alaska, which had been caught off guard by an early winter. Quietly – and overshadowed by the technology’s much more well-documented and controversial military uses – the commercial drone industry is booming. Across the globe, unmanned aerial vehicles (UAVs) are being used for real-time mapping, crop monitoring and in myriad other capacities. And as American regulators struggle to come up with a rulebook for the fast-moving industry, Canada has emerged as perhaps the centre of commercial drone technology – from Ontario farmlands to Alberta’s oil sands. In December of last year, online retailing giantAmazon.com Inc. gave the commercial drone industry a marketing push, announcing it aims to one day deliver packages to customers in 30 minutes using unmanned aircraft. But the announcement – timed to make a media splash around the busiest shopping period of the year – is somewhat premature, given that the company won’t be able to legally fly such drones until 2015 at the earliest. A regulatory quirk has given the Canadian consumer drone industry a multi-year head start on its American counterpart. In the United States, unmanned craft can only be used in a non-commercial capacity – for example, by law enforcement agencies, search and rescue teams and border patrol agents. And although some people may regularly flout that restriction, civilian drone usage is unlikely to become a widespread phenomenon in the U.S. for another half-decade, well after the Federal Aviation Administration produce guidelines for commercial unmanned aircraft. In Canada, such regulation already exists. Any person or company looking to operate UAVs for commercial purposes can do so by filling out a Special Flight Operations Certificate. The program, run by Transport Canada, requires operators to list the times, dates and areas in which their drones will fly. It also contains rules relating to line-of-sight and buffer distances over populated areas, among other safety guidelines. Once Transport Canada approves an application, the drone is clear to fly. Canadian companies are starting to take advantage of the country’s relative regulatory clarity. “There’s been a lot of stuff going on relatively quietly up in Canada,” says Ernest Earon, CEO of Precision Hawk, a Toronto-based company that designs drone-based data collection and analysis tools. Many of the company’s customers are Canadian farmers, who use the technology to check on the health of their crops. Unmanned craft, he notes, can also be used to collect water samples, monitor the impact of greenhouse-gas emissions in the far North and check on the health of the boreal forest. In the heart of Canada’s oil industry, the UAVs are also taking flight. The Canadian Energy Pipeline Association said some member companies have done limited tests with drones. Royal Dutch Shell PLC has tested unmanned aircraft for land surveying at its Jackpine and Muskeg River oil sands mines. Syncrude Canada Ltd. has been using them for the past few years to map reclaimed areas, looking at details such as shoreline vegetation growth. Canadian oil sands giant Cenovus Energy Inc. is working to build a fleet of UAVs, beginning with one $30,000 SenseFly eBee model. Transport Canada has just approved a flight and mapping program at three of its project sites, and beginning this month the company expects to conduct drone flights at least once a week. “The technology is at a stage where it’s pretty easy to use, it’s pretty easy to fly and then we can process here at our desktops and acquire a better result than what our traditional methods are,” says Wade Ewen, a senior adviser for the company’s geographic information systems group. One of the main hurdles for drone use is what happens when they travel out of eyesight, and how operators ensure they don’t run into other aircraft. Right now Canadian regulations don’t allow drones to fly out of view. Sterling Cripps of the Canadian Centre for Unmanned Vehicle Systems in Medicine Hat, Alta., says along with the further development of “sense and avoid” technology, progress in the regulatory framework is key. The southern Alberta centre was created with provincial and federal funding, and grew out of a cluster of UAVs for military use at nearby Canadian Forces Base Suffield. But the centre is now self-sustaining, with revenues from training courses, helping companies with UAV paperwork and renting out its $900,000 catapult for drone-launching. The main question for Mr. Cripps is how to make Canadian airspace safe with unmanned vehicles in the mix. For the past six years, he has been working to get Transport Canada’s approval to create the country’s first restricted airspace area – near Foremost, Alta. 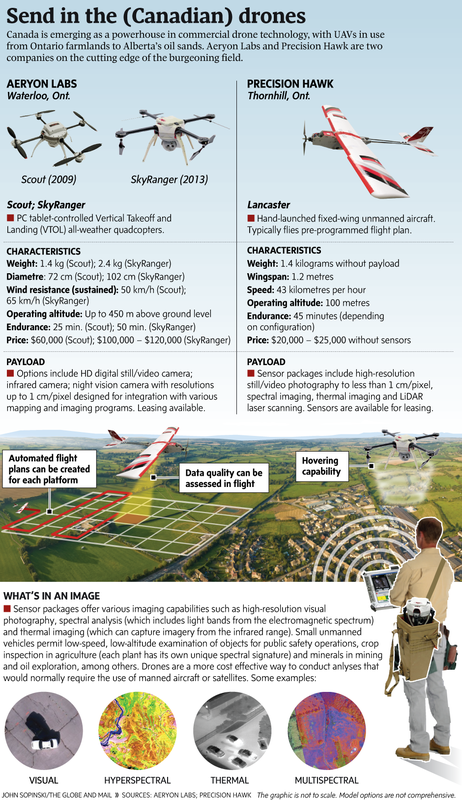 – for testing commercial drones out of eyesight. Read the original post here.